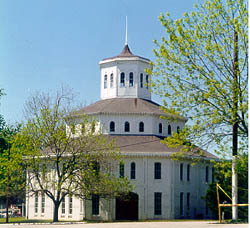 Floral Hall was built in 1882 by John McMurtry. The building was originally an exhibition hall for floral displays on what was then the Fair Grounds of the Kentucky Agricultural & Mechanical Association. 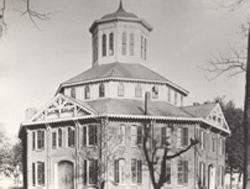 The large, brick octagonal shaped building is approximately four stories tall surmounted by a large windowed cupola. The interior of the building is a large open space, a functional design for use as an exhibition hall. In 1896, the fair grounds were purchased by the Trotting Association and the exhibition hall was converted into a horse barn. by the Civil War. During the war the site was used as a military campground. Beginning in 1875, the Fair Grounds and Floral Hall were leased for race meets by the Trotting Association, which eventually evolved into the Red Mile Trotting Track. At the site of the Red Mile Track the harness-racing industry in Kentucky developed fully. In 1963, after a renovation, the name of the building was changed from Floral Hall to the Standardbred Stable of Memories. Today, although not open to the public, the Standardbred Stable of Memories is the most visible building of the Red Mile Trotting Track. The Standardbred Stable of Memories is located at 847 South Broadway adjacent to the Red Mile Race Track. It is not open to the public.